A selection of Christmas stockings for the outdoors lover. Choose from camouflage, hunting, shooting or fishing. 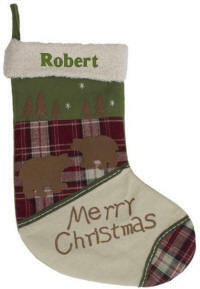 Each Christmas stocking may be personalized with an embroidered name. We love the orange blaze and camo combination. Mossy Oak Break Up Infinity Mini pattern . Stocking has an olive green fleece cuff, a brown felt back and is not lined. We monogram a name across the cuff. 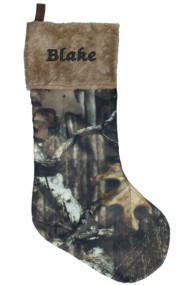 Mossy Oak camo in a huge Christmas stocking. Just add gifts. 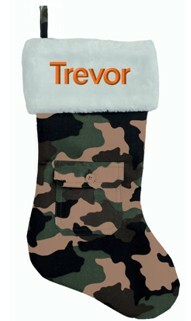 We love the faux fur white top which adds a little cozy feel to this camo print Christmas stocking, and of course is the perfect spot for your name to be embroidered. 19 inches from top to toe, 7 1/2 inches wide. Ready to fill with some fun Christmas stocking stuffers! This adorable white tail deer Christmas stocking will be the focal point of your Christmas display. Enjoy the felt wired antlers, bulging eyes and large black nose. 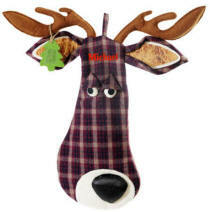 This plaid fabric deer stocking is a fun Christmas stocking for the outdoorsman in the family. The deer stocking has a brown felt back and hangs from the center hook. 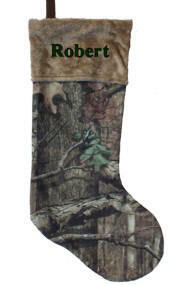 We will embroider this Christmas stocking with a first name or nick name. Create the perfect Wildlife atmosphere with this Bear Merry Christmas stocking. It look great personalized and will be perfect for stuffing.